Like many of us, Lindsey was introduced to riding through her family. In fact, she was on a Husqvarna before she could walk. 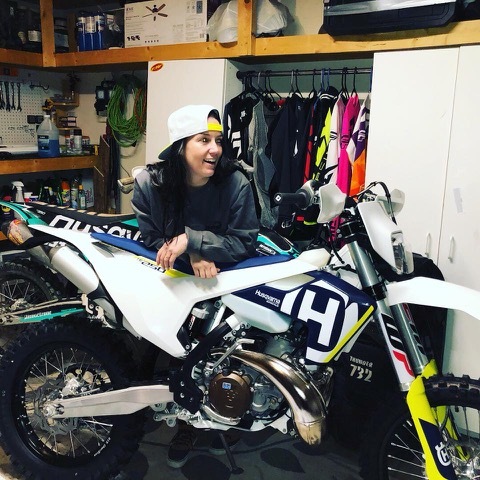 We first met Lindsey through her work at the Kurt Caselli Foundation. Her passion for the sport and for the industry as whole is evident in all that she does. She is an inspiration to us and we got the chance to chat with her about her life on two wheels and how she likes her Husqvarna 2018 FE 350. I work full time at the U.S. Motorcycle Coaching Association (USMCA) as the Content & Communications Manager as well as the Marketing Specialist for the Kurt Caselli Foundation. 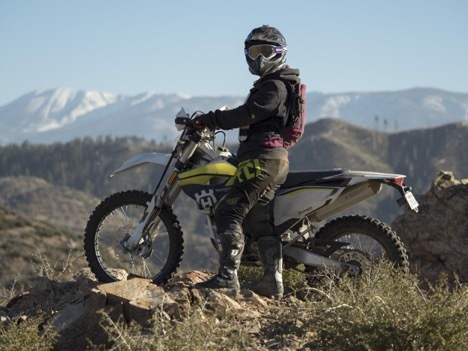 Both jobs are supported by the KTM Group; the Kurt Caselli Foundation is backed by KTM’s support and the USMCA’s Founding Partner is Husqvarna Motorcycles. My jobs are…. All over the place from content managing to building social media campaigns to event planning and everything in between. I love to learn new things and am always adapting to the needs of each organization. I was born and raised in Tustin, CA and later moved to San Clemente, CA. Recently I moved to Menifee since my job and life headed this way. Also, I can ride from my garage to tracks and trails —how rad is that?! When when were you first introduced to riding dirt? Who introduced you? I was first introduced to riding by my dad at a very young age. When I was a baby, my dad would ride around the neighborhood with me on his 1983 Husqvarna XC250. When I was 8 years old, my brother Brad got a Suzuki JR50 for Christmas that I ended up riding before he had the chance to ride. I’ve been riding off and on since I was about 8 years old. That’s where my roots of motorcycle riding come from! Well, I started off on a 1970’s Suzuki JR50, and quickly moved up to a YZ80 then a KX80 (both from the 80’s). When high school came, I sold my motorcycles to get a car (doh!). High school took over the next few years. Once I was in college, I started working at an online Automotive company that was a part of the publishing company that owned Dirt Rider Magazine which got me back into motorcycles. I bought one of our test bikes; a 2009 Honda CRF150Rb and finally moved up to the big bikes with a plated 2004 Honda CRF250X. Working for a magazine, I got to test ride a grip of really cool motorcycles to see what I liked. Having that opportunity can really narrow down the list. Fresh with paper plates, I just bought a 2018 Husqvarna FE350 —which I am absolutely in love with! Also, I kept my CRF250X so my friends can come ride with me. My other bike would probably be some sort of sportbike. If you ever get a chance to ride a track day at Chuckwalla, you’ll fall in love with sportbikes as I did. The bike I ride now can take me to more places (since it is street-legal) than your typical street bike or motocross bike. I’ve done a few Adventure Rallies before on the Husqvarna FE250 that wouldn’t have been possible for me to ride on a non-plated, off-road motorcycle. The power of the 350 is perfect for any destination rides that take me on a high-speed highway and yet manageable enough for me to handle on the trails. Technical & challenging (to me) but not a true death march. My favorite is destination rides -a ride that takes you to someplace that is naturally beautiful and hard to get too. My second ever off-road race. It was the Checkers MC’s Barstow National Hare & Hound race in 2015. 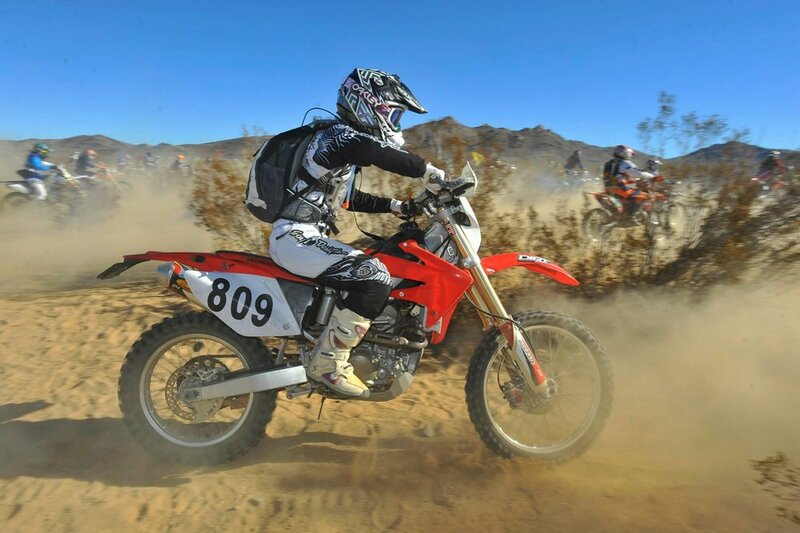 If you have never heard of National Hare & Hound racing, it is a dead-end start desert race. You wait for the banner to drop, once it drops you start your engine and race against everyone on the starting line in your class for about a mile or longer over uncut desert terrain (“Bomb Start”) toward the race course. It is basically a mile-wide lineup of riders that funnel into the same spot. Here’s some helmet cam footage from Pro rider Ricky Brabec: https://www.youtube.com/watch?v=CP4M83S4pZk. You are not allowed to pre-run the course other than the bomb start; the races are typically 35-75+ miles for the novice class and you race by navigating off of pink ribbons tied to bushes and danger markers staked in the ground. It was wet, cold and the course was filled with rocks and slippery from the consistent rain. It might have also been mentally challenging because I went into it thinking this is going to the be the easiest of the year since I knew the Barstow off-road truck race courses like the back of my hand. But I was wrong! This course ran through virgin terrain and further South of “Barstow Main” than I had ever been. Somehow I ended up making it to the finish line after 35 miles of ribbon and got my finisher pin. There were 329 racers that lineup that day: 220 riders finished (I was the 208th person to cross the finish line) and 109 riders did not finish (DNF). Of course, there are different classes which have additional course mileage that my class did not race (Pro racers ride additional, advanced loops), but that is a pretty heavy DNF rate for any NHHA race. I think the Pro’s finished the race before it started raining. It was miserable but all worth it when you get to the finish line. Colorado! Crested Butte & Gunnison areas. The scenery is breathtaking. Hmm… I think there’s a lot of places I want to ride on my moto bucket list still. I think one day, I want to try and race a GNCC. Yes, I love finding new female friends to ride with. I’m always down for a cruise or a challenge, so I will ride with other girls of any skill level. Luckily, I have a lot of female friends that ride! Yes, I look up to a lot of other women in the industry and women riders. Active, strong, vocal women riders like Ashley Fiolek (@af67), Megan Griffiths (@megs_braap), Jacqueline Carrizosa (@brojaq), Kelsey Abbott (@DA8Apparel), Rhiannon Kamo (@PCIRaceRadios) and so many others. Anya & Ashmore — you two women are a blessing to the sport and industry, and an inspiration to me! As well as men in the industry who support women riders. All of my co-workers at the Kurt Caselli Foundation and the USMCA —Donny Emler Jr. (a true hard worker always on the go and being creative), Christy LaCurelle (a boss woman. ), Jenna Parker, Momma Caselli, Carolyn Caselli, Sarah White. I really do look up to everyone I work with —I’m surrounded by so many people who inspire and help me to grow on and off the bike as a person and a rider. My boyfriend Joey, my friends Brittany Brooks, Justin Morgan, David Kamo, Mark Samuels… Too many people to name! I was pleasantly surprised! I was nervous and thought I’d be going out to a weekend full of drama & cliques since there are a LOT of girls out there —but everyone was so nice, kind, welcoming and supportive. I met a lot of new riders or girls who have only ridden with their dads, brothers, boyfriends or putted around camp on a bike. It’s always a fun weekend of seeing new riders enjoy their time on motorcycles, correcting bad riding habits, giving tips to help improve their experience and helping girls challenge themselves. The coolest thing is seeing someone’s expressions after they conquer something they didn’t think was possible. Find a mentor, coach or riding school that can help you enjoy your first ride or adventure! If you’re new to the sport and are nervous or have questions, hit me up at @LindseyLovell on instagram and I can give you a few tips whether you’re just starting out or looking for a new adventure. 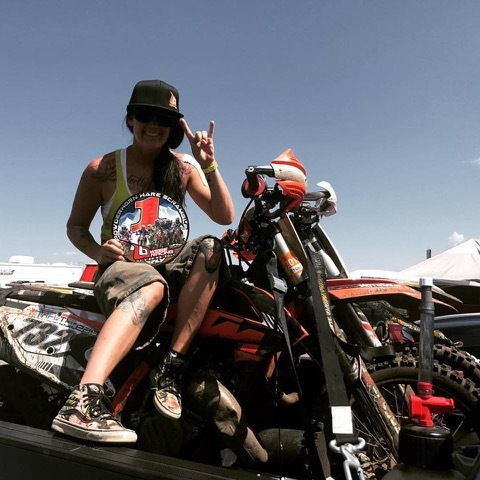 I think what Anya & Ashmore have created with Babes Ride Out and Babes In The Dirt is absolutely needed in our sport of motorcycling, inspirational to other women in the industry and to new riders. It’s like having an inclusive clubhouse where like-minded women can come together to help support each other and share a good time on two wheels! Gabriella is one of those really awesome women that reminds us why we ever started Babes in the Dirt & Babes Ride Out. She always has a smile on her face and you can really see that riding has fulfilled her life in a lot of ways. I recently moved to the area where she lives and she was quick to invite me on some rides. After a run rip on our Husqvarna's to some of her local trails I couldn't wait to hear more about her story. I work at CalTrans and am currently working on getting my Class A driver’s license so I can operate all of the big boy toys. I also went to welding school almost 3 years ago now, but it’s on the back burner at the moment. Big Bear, CA. I moved up here 9 years ago to snowboard, but now I love living up here even more to dirt bike. I’m actually pretty new to riding, but I’ve been around dirt bikes for about 15 years from my family. About 2 years ago my boyfriend Josh and I were camping with some friends down in Johnson Valley, where I hopped on our friend's TT-R230 and gave it a shot. I kind of had an idea on how to shift from hearing family and friends talk about riding, and knowing how to drive a manual car. We just putted around camp, but that was enough for me to realize that I was addicted. I guess that answers the next question, too, haha. Dirt gives me another playground to play on, something new and ever-changing to challenge and push myself. I’ve only had one bike; the bike I have now. I’d love to have a 2 stroke, the Husky TE250i. The only 2 strokes I’ve ridden were a 2017 KTM 250 Freeride (Thanks, Suzie, for letting me give her a rip) and a mid 1990’s KX500. The KX was sooo much fun. 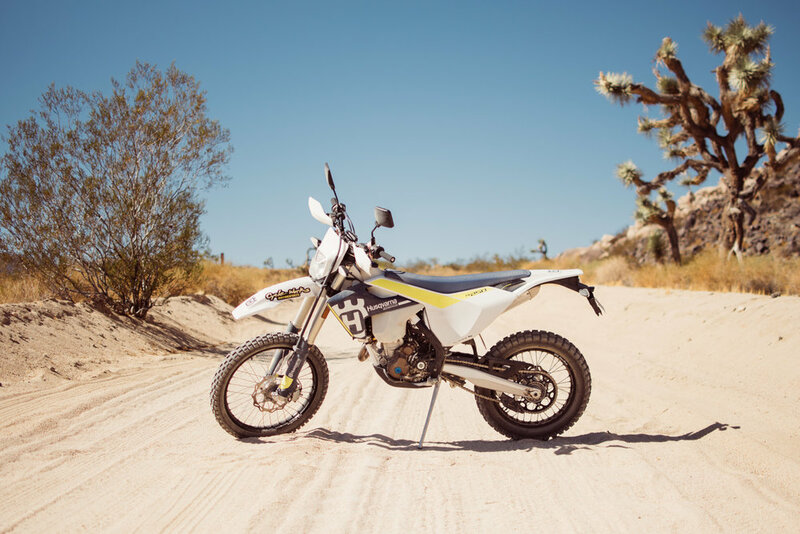 It had what I felt like was an old school feel, stiff suspension with Ricky Carmichael-like bars and a ridiculous amount of power that just worked me in the desert woops. I wish I had more experience on different bikes to give it a comparison, but I don’t have any complaints or dislikes about my bike now. I love every little thing about it! As it’s been my only bike, hopping on a big bike as a very beginner rider was hard and frustrating. Learning how to ride that bike, while learning how to ride different terrain, was all a challenge. But once I felt myself getting more and more comfortable and trying harder lines and terrain, I realized my bike needed a regear. We put a 49 tooth rear sprocket on my bike and it made a world of difference. It made me love my bike even more! I like trail riding, the slower, technical stuff. Some tight single track, or bigger rock sections. Rocks! Not boulder size yet, but bigger than the small shelly rocks. I’m still learning how to throw my weight around on my bike and learning to look for spots to put my feet down to stay upright while riding through rocks. Dang, there have been many. But the one that comes to mind first is this uphill rock/loose dirt-to a-downhill, flatter boulder-sized rock section in Johnson Valley, literally in the camp zone we usually camp in. I had been eying it for a few trips and watched Josh and some trials guys go up and over it. One day we were on our way back to camp from a ride, where our group split at the end and I followed one guy to this section. He went up and over it not realizing I was below him, watching him and the line he picked. I sat there at the bottom of it for a few minutes, looking at the lines and trying to motivate myself. I attempted it, made it up about half way before losing traction and sliding out. I don’t know how long it took me to get up it, but I stuck with the outside line that didn’t have any rocks in it but was all loose dirt. When I got to the top I looked down at our camp where I heard the guys say, “she got up that? !” I rode down and told Josh that I wanted to do it again, because it’s “2 to be true” and “3 to be a G” haha. So we rode around to do it again. This time I had a bit of a crowd from the campers on that side, which put an awkward pressure on me. But I really wanted to claim it solidly so I ignored them. Except for one older dude who came over trying to give me advice; he was super cool. I kept trying to hit the same line, on the far right which was the dirt without rocks. It just looked the easiest to me, but I kept sliding out in the same area. My bike died because I got fuel in the charcoal canister from dropping it so much. That just added on to my frustration, but I was so determined that I wasn’t letting it get to me. It was a real mental game. Finally I said f*** it, and went for the middle line which had no run in and was steep, flat rocks with some round ones throughout it. First try, I made it right up, where I just started cracking up at the top like, “why the f*** was I so scared of that line? !” I turned around and Josh and that camp were cheering me on. And then of course I stalled my bike going down the backside and couldn’t get it started, so I just coasted down to the truck. haha. Big Bear! There’s so much to explore up here, and so many different levels of riding terrain. I haven’t even touched half of it yet; I can’t wait to get better to ride it all. B.C., Colorado, and a long touring ride in Euroland! Not specifically. I just like to watch all types of riders and pay attention to their styles, and try to duplicate it myself to see if it helps me or not. Unreal. Seriously, you can watch the recap videos and hear stories from the babes who have gone, but until you go and see what it’s like for yourself, the only way I can describe it, is as unreal. My first event was BRO 4, where I rode down from Big Bear on my Husky with my friend Harmonee who was on her Harley. I was extremely anxious, going on my first long highway ride, still very beginner and expecting there to be all Harley’s. We arrived at night, and as we were checking in and getting our wristbands put on, the lady told us, “get drunk, get naked, have fun!” We knew right away we were meant to be there. I was surprised by the attention my bike got too. I guess a lot of girls there hadn’t been on dirt bikes or heard of Husqvarna. I was so stoked to let them check out my bike. The women there were unlike any other women I’ve been around. Everyone was so friendly, so cool, so FREE, supportive, curious, nonjudgmental, and an all-around good time. I didn’t know what to expect, but whatever I did expect was surpassed to the moon and back. And then when I went to BITD that following April, where I didn’t think I could have a better time than I did at BRO 4, somehow I did! Maybe because we were in the dirt, or because I had a Husky where Husky was one of the sponsors. But I had an even better time! 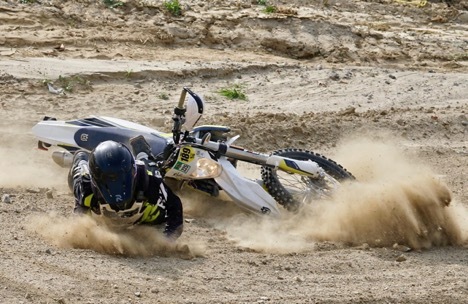 Whether you want to get in to dirt bikes or street bikes, go for it! Motorcycles are so much fun, and the motorcycle community is very supportive. Just be safe, take your time and most importantly, have fun!